I have recently received a push button 2.4 radio that was made by a friend and then given to me. It is quite a steep learning curve trying to trim and fly like it was done in the old days. built a basit trainer in a afternoon and it flies quite well but a better airframe was needed. When I was a kid I used to ream my dads RCM&E mags and loved the articles by DB who was a legend in my opinion. When I older and working at South African Airways I had the privilege of speending time with him on a number of occasions and even built a few prototypes for some of his plans. The one thing I new about DB was that he had a gift for designing aircraft that were easier to build and all flew very well. I decided that I would build an Apprentice as I liked the looks and it reminded me of the Veron Impala that my dad had started to teach me to fly in the early 70,s. The Impala still had a escapement(servo) in it. The plan from outerzone was enlarged and the airframe built to the plan but I had to increase the size of the pylon a little to accomodate the electric motor that I wanted to use. One thing that I did find surprising was that the tailplane was glued to the fuselage and not held with elastics so that would make trimming little more difficult. The long dorsal fin made it hard to use elastics so I decided to go according to the design. Soon the aircraft was ready to fly and I decided to go to a field with long grass to do the test flights just like it was done in the old days. Due to the motor being on a pylon I did the first launches with only a little power to prevent the motor forcing the nose down. First launch resulted in a nose dive into the ground less than 2 meters in front of me. Try again with no power, same result. Take home and consider options, I removed some of the nose weight ans reduce some of the down thrust. Tried again with the same result. A friend looked at the design and suggested moving the wing forward as the lip on the fuselage would increase the incidence on the wing and motor. Tried again with much the same result. More packing, same result. I then downloaded the impala plans to see if I could find any clue to what is wrong with my Apprentice. The plans had quite a number of tips on how to trim the aircraft and it was clearly stated not to change the incidence but rather trim with moving the cg position which I noted was further aft than the apprentice. I then removed most of the lead I had used and went to the field around the corner. It had started to drizzle a bit but there was no wind so I decided to try anyway. I was sure that the Apprentice would now fly. A little power, launch and a dive into the soft ground 3 meters in front of me. Take more lead out, cg around 50% of wing, add more upthrust to the motor and try again, same result. Move lipo back, more up thrust, same result. I then looked at the situation and laughed at myself and thought a Dave would be finding this all very funny as he had a wicked sense of humour. Has anyone built and flown an Apprentice or have any ideas for me. 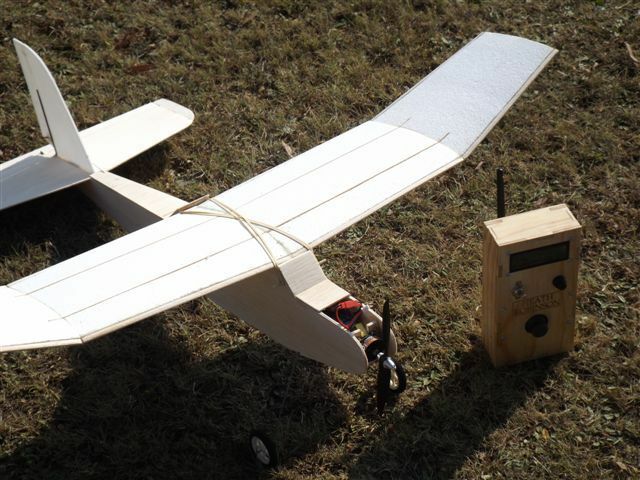 Having flown one in my early days of transit from free flight to RC I would put the cog back at about one third back from the leading edge and then raise the trailing edge of the tail plane until you get an extended glide [over the long grass] and only then try on power. 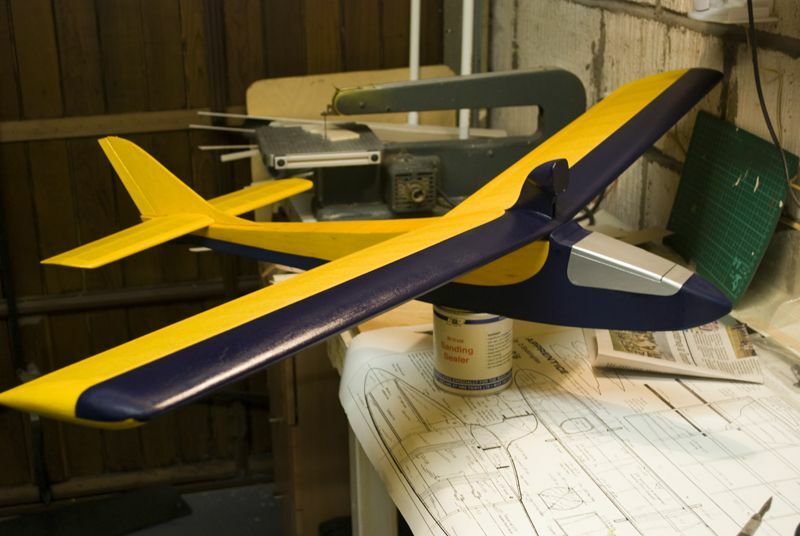 Can not remember how easy this adjustment would be on the model,but also do not recall the tailplane being fixed like yours. Good luck. I built this Apprentice last year and like you I could not get it to fly properly. 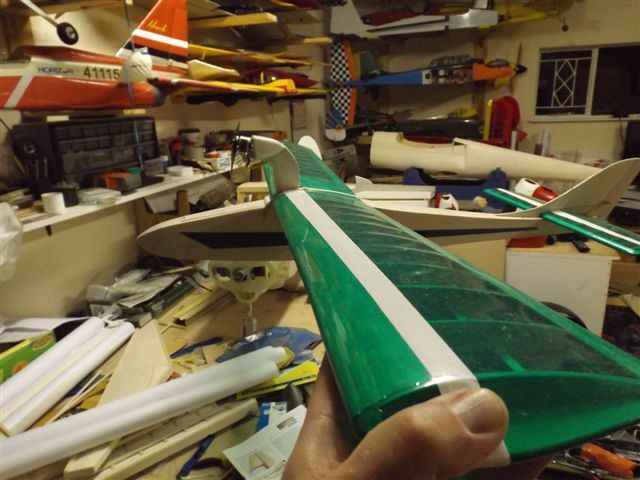 As I had glued the tailplane on like yours I had no option but to increase the wing incidence by adding a tapered seat to the fuselage. 1/8" at the leading edge. Now flies fine. A better solution would be to remove the tailplane and adjust the incidence this way. Thanks for the information, I did cut off the tailplane and added elastics to hold it in position. With a 4mm shim added I can now get it to fly but find the rudder marginal in the respose, I need to ask it to turn and cannot tell it to do so! I like the colours that you used and still find it strange that an airframe that looks so good can be such a blighter to get it to fly well. I need to try move the CG position to help the rudder response. I see the old Dremel jigsaw on the workbench, Mine is the most important tool in the workshop. 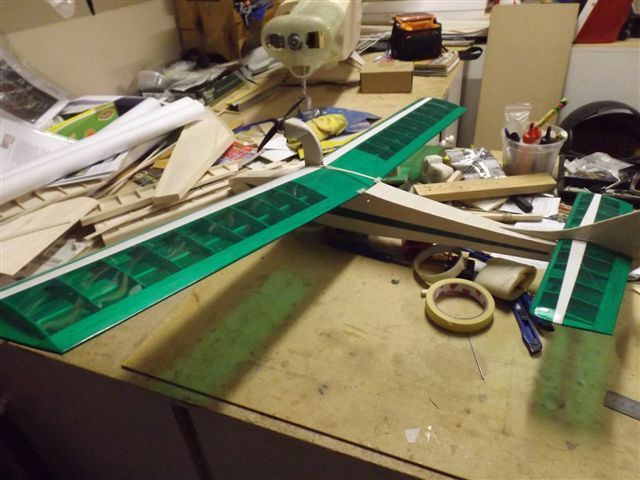 During the build I increased the rudder area by about 50%. It still has to be 'coaxed' in a right hand turn but turns left just fine. Strange model indeed.